For many months after Pops died I wrote letters to him on My Melody stationary with pink rollerball ink, telling him how much I missed him and what was on my mind. But it was never about the actual letters for me, it was about the writing. Writing was not a way of communicating with my grandfather, but a vehicle through which I engaged in the act of remembering. The letter writing slowed down over time, then stopped altogether. I suppose at some point I no longer needed it. Every few years, while waiting for a bus or walking down a street, I inhale a whiff of the aftershave Pops used to wear. For one brief, deep inward breath he is right there with me, mingled with my breath before he disappears on the exhale. This is the complicated stuff of memory. Remembering what we did not realize was there to forget. It takes us by surprise. I had an experience like this recently during a visit to the Tribute WTC Visitor Center, a project of the September 11th Families’ Association. I’d been living in Los Angeles for several years and had put some distance between my present self and the months immediately following 9/11. When I walked into the gallery and saw copies of missing person posters on the wall I was caught off guard. I remember looking at those posters after the towers fell, my angst growing during the months between September and December, knowing full well that as time passed families hopes for finding their loved ones shifted to hopes for finding identifiable remains. It was the angst I had forgotten. The most difficult content was in gallery 4, the very last room on the first floor. 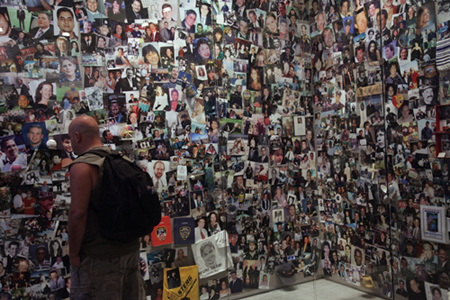 The gallery was filled with photos of those who died on 9/11, submitted by their families. Formal portraits posted next to photographs of birthday parties and weddings. I find myself returning to those images often, wondering what is is about them that triggers such a strong emotional response. 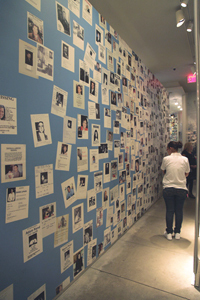 Perhaps it is simply the magnitude of loss, the overwhelming crowd pinned to the walls. Or maybe it’s the personal nature of the photos. The genuine smiles. The unnamed bride full of joy on her wedding day. Perhaps they are so evocative because like the posters, we recognize fragments of our own lives in the collage of snapshots and it’s just too close. § 3 Responses to The complicated stuff of memory." It’s the reminder, I think, that no matter what part in history you played … we’re all just people. People with people who care about us, and people who miss us. Zipp you are such a talented writer. I completely identified with your last blog post. So eloquently written..
this is beautiful zipporah. i lost your uncle sid in 1976. will always miss him. was hard raising 3 children alone. i’ m sure you would have loved him. he was a great husband an father. sad he never got to see our beautiful 10 grandchildren an 2 great grandsons. he loved his children an they loved him. abby wrote a beautiful poem of him. i put it in the jewish exponent. i also burried both of my parents myself. went thru alot of trama now i hv juvenile diabetes. i am on an insulin pump. mu older son barry lost half his foot from juvenile diabetes. You are currently reading The complicated stuff of memory. at After 9/11.